Many years ago there lived a king of Scotland and his name was Robert the Bruce. If someone’s first name is “Robert” and the last name is “Bruce,” you may think his name would be “Robert Bruce.” Yet this king’s name was “Robert the Bruce. That is how it used to be done in Scotland, in those days. Robert the Bruce was a brave and wise king. He had to be brave because his country was at war with England. And he had to be wise because England was bigger than Scotland and had a much bigger army! Robert the Bruce led his small army of Scotland against England six times. And six times, they lost. At last Robert the Bruce and his army had no choice - they had to run away. But where? Some men ran into the woods and others found a cave. Here and there they hid. And they waited. One rainy day, Robert the Bruce lay in a cave. The rain fell hard outside. He felt tired and sick at heart. His army had lost six times! He may as well just give up, he thought. What good was it to try anymore? As he lay there, Robert the Bruce saw a spider over his head. The spider was getting ready to weave her web. Six times she tried to throw her thread from one edge of the cave wall to another. And six times, her thread was too short and fell before it hit the mark. But the spider did not lose hope. With more care, she made ready to try another time. Robert the Bruce almost forgot his own hard times. He could not take his eyes off the spider. Would she fail again? No! This time the thread reached the cave wall and stuck. So the king rose out of his cave. He called his men together. England thought they had already won the war, he said. And so their army could be surprised. All they needed was to fight one more time. He knew they could do it! So Robert the Bruce led his brave men into battle for a seventh time. And now it was the army of England that ran away. They ran right onto their ships and sailed all the way back to England! England saw that from then on, Scotland had to be own country. Who would be king? Why, Robert the Bruce of course! To this very day, people in Scotland remember the story of Robert the Bruce. They thank him for bringing his men together a seventh time to fight for Scotland. And they remember the spider in the cave who made him feel that he would not give up. 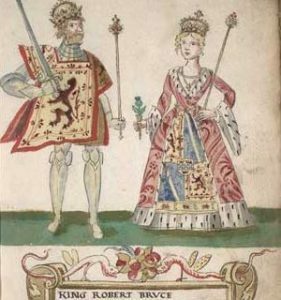 Why did watching the spider give Robert the Bruce hope? Tell about something you've seen that inspired you to not give up. Robert the Bruce, known as Robert I after becoming king of Scotland, was one of the greatest kings of Scottish history. His achievement in rallying the Scottish nation behind him in resistance to the English is all the more remarkable by his lack of resources at the time of his revolt in 1306. The revolt was defeated, Bruce's lands were confiscated and he became a fugitive. The story of his wanderings is very much embroidered with traditions and legends: the best known is the tale of his watching the spider while he was in hiding on Rathlin Island (now in Northern Ireland), and drawing inspiration from the perseverance of the spider in spinning her web. Gradually he recruited followers again, and in 1314 won at Bannockburn the greatest victory that Scotland had ever won or was to win over England. Fourteen years later Bruce secured a treaty with England recognizing the independence of Scotland and his right to the throne. He lay in a cave and looked at the ceiling. Which she started to spin on the beam overhead.